Preheat oven to 350°F. Line a 9x9 pan with foil and spray with nonstick cooking spray. Beat cake mix, butter, and egg with a hand or a stand mixer until a stiff dough forms. (If you’re using a hand mixer this will take awhile.) Press about 1/2-2/3 of the dough in the bottom of the prepared pan. Spread Nutella all over the crust layer, avoiding about 1/4” around the edges. 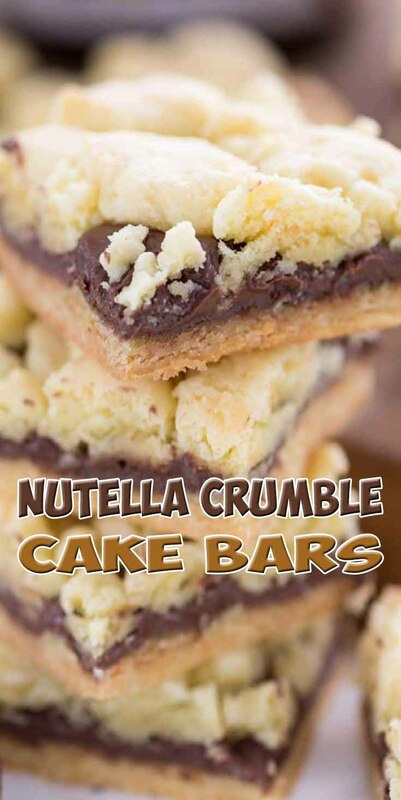 Sprinkle and spread bits of the remaining dough over the top of the Nutella, being sure to cover the edges. Bake for 20-25 minutes until the top is just starting to get golden around the edges. Cool completely before removing from pan and slicing. Store in an airtight container for up to 3 days or freeze for up to 1 month.